Has it been awhile since your last exhaust system cleaning? You could have a fire code violation on your hands. Plus, you may be putting your restaurant at risk of serious damage from a grease fire. Stop worrying and hire Flue Steam. We have been providing superior restaurant kitchen exhaust cleaning in Camarillo CA since 1971, and you can count on our certified techs to help you meet your code requirements and keep your kitchen and your employees safe. 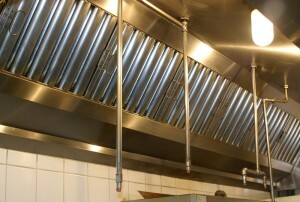 We offer two methods of restaurant kitchen exhaust cleaning in Camarillo CA, hand scraping and steam cleaning. Hand scraping is an affordable way to remove greasy buildup from the areas where it accumulates the fastest, namely your exhaust hoods. This service is usually needed about once per month. Steam cleaning is a more thorough process that uses hot water to remove grease from the entire exhaust duct system. Most restaurants need this service 2 to 4 times per year. With help from Flue Steam, you don’t have to rely on guesswork to determine when you should get these services. We’ll work with you to come up with an appropriate service schedule based on measurements of your grease deposits and on fire code requirements. Exhaust fan inspection: Every restaurant kitchen exhaust cleaning in Camarillo CA includes a free fan inspection to help ensure this vital part of your exhaust system is working properly. Whether it’s time for a routine cleaning or you need an emergency restaurant kitchen exhaust cleaning in Camarillo CA, you can count on Flue Steam. We can have a crew at your restaurant ASAP. Please call 800-700-FLUE now to schedule service.